Hopewell Private Game Reserve - Colchester / Cannonville Accommodation. Situated in malaria-free coastal valley bushveld, Hopewell is just a 40-minute drive from Port Elizabeth airport and offers the ideal destination for those seeking privacy, tranquility and adventure. A wonderful start or end to your trip along the famous Garden Route. Remember to bring: Binoculars and camera, comfortable walking shoes, sunhats, sunglasses & sunscreen. 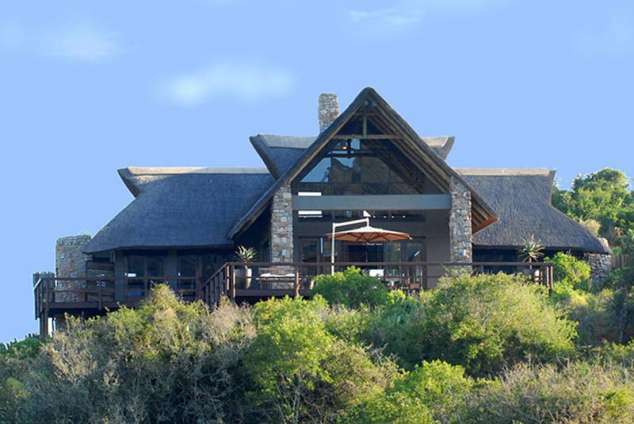 The secluded and spacious main lodge is perfectly positioned for panoramic views over the reserve. Perched above the elephants’ favourite watering hole, the deck is the ideal spot for relaxation and some idle game-viewing. Natural materials throughout and scenic views from every angle immerse guests in this exclusive back-to-nature experience. Furnished in contemporary safari style with a focus on comfort and relaxation, the lodge is airy and light, with thatch to insulate against the African summer heat and fireplaces to ward off the winter chills. The stylish and comfortable lounge and dining room lead on to a wide deck, with another lounge and intimate conference facility upstairs. Two stylishly decorated en suite Standard Suites with separate outside showers overlooking the indigenous bush are available in the Main Lodge. These rooms would be suitable for a family of four or for those who prefer not to walk too much. Enjoy meals in the lodge or outdoors on the deck or in the boma – weather permitting. These two suites do not have access to a swimming pool. Named for the indigenous people of the Eastern Cape, the Nguni private suite allows guests to enjoy beautiful open views of the surrounding landscape from the comfort of a private deck or the stylishly-furnished interior. Designed to maximise both privacy and uninterrupted valley views, the open-plan suite flows seamlessly from luxurious living to sleeping to bathroom, all warmed by a cosy fireplace. Nguni has no swimming pool but an extensive deck and a fabulous private bush gazebo with views over the dam. The gazebo is a mere 5 metre walk from the deck. Just as the Cape Mountain Zebra is indigenous to the Eastern Cape, so this exclusive hideaway blends harmoniously with its natural surroundings. The stylish suite offers peaceful seclusion and uninterrupted views over magnificent valley bushveld. Open-plan living flows seamlessly from luxurious sleeping to bathroom area, encompassing the scenery to be enjoyed from the private deck and pool, or the comfortable interior by the fireside. Zebra is one of four private suites and has its own private pool. Contemporary and stylish, the Buffalo private suite presents breath-taking views over the valley below. Indoors and outdoors merge across the sundeck into a private pool that appears to float over the landscape. The airy open-plan suite flows seamlessly through luxurious living, sleeping and bathroom, designed with comfort and attention to detail in mind, and all warmed by a cosy fireplace. Buffalo is one of four private suites and has its own deck and pool. Indulge your senses with all-encompassing valley bushveld views from the comfort of the stylish interior of the Rhino private suite or over the secluded deck and swimming pool merging into the spectacular landscape. Designed with privacy and supreme comfort in mind, the open-plan suite flows seamlessly from luxurious living to sleeping to bathroom, all warmed by a cosy fireplace. 213 page views since 02 Jul, 2018.